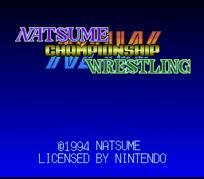 Natsume Championship Wrestling is a 1994 Super Nintendo Entertainment System video game that was released in North America. This game is widely based on a conversion of Zen-Nippon Pro Wrestling Dash: Sekai Saikyō Tag (全日本プロレス’ 世界最強タッグ ダッシュ?, lit. "World's Strongest Tag Team Wrestling Dash 'Japan "), a Japanese video game for the Super Famicom. Players must become either the Triple Crown Champion or the Triple Crown Tag Team Champions and achieve the limits of professional wrestling. NBA Give 'N Go is a 1995 Super Nintendo Entertainment System basketball video game that uses licensed teams from the National Basketball Association. The game is essentially a home version of Konami's arcade game Run and Gun, which featured similar graphics and gameplay but no NBA license. Konami followed up Give 'N Go with Run and Gun 2 and the NBA In The Zone series. 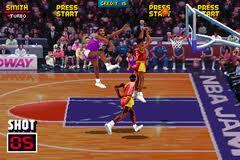 NBA Hangtime is a basketball video game published & developed by Midway and released for arcade in 1996. Home versions followed for Nintendo 64, PlayStation, Sega Mega Drive/Genesis, Super NES, and Windows. A version for Game.com was cancelled.Hangtime was the third basketball game by the original development team behind the NBA Jam series. The title was changed due to the NBA Jam name being acquired by Acclaim Entertainment, the publisher of the games for the home market. Acclaim's NBA Jam Extreme was released the same year as Hangtime. Features introduced in Hangtime included character creation, alley oops and double dunks. A software update known as NBA Maximum Hangtime was released for the arcades later in the life cycle.The ending of Maximum Hangtime promises a new, 3-D basketball title from Midway, which was eventually released as NBA Showtime: NBA on NBC. 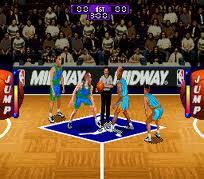 NBA Jam is a basketball arcade game developed by Midway in 1993. It is the first entry in the NBA Jam series. The main designer and programmer for this game was Mark Turmell. Midway had previously released such sports games as Arch Rivals in 1989, High Impact in 1990, and Super High Impact in 1991. 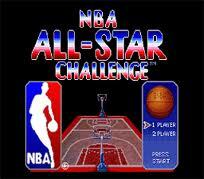 The gameplay of NBA Jam is based on Arch Rivals, another 2-on-2 basketball video game. However, it was the release of NBA Jam that brought mainstream success to the genre.The game became exceptionally popular, and generated a significant amount of money for arcades after its release, creating revenue of $1 billion in quarters.The release of NBA Jam gave rise to a new genre of sports games which were based around fast, action-packed gameplay and exaggerated realism, a formula which Midway would also later apply to the sports of football (NFL Blitz), and hockey (2 on 2 Open Ice Challenge). 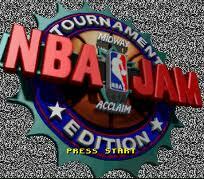 An update named NBA Jam Tournament Edition (commonly referred to as NBA Jam T.E.) featured updated rosters, new features and easter eggs combined with the same gameplay of the original. 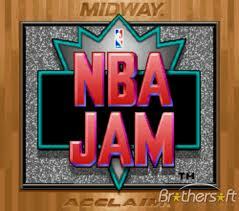 Jon Hey created new music specifically for NBA Jam T.E. 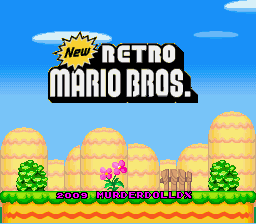 to replace the original NBA Jam music. Teams now consisted of three players (though only two could be on court at any time), with the exception of the new "Rookies" team, which consists of five players, all picked in the 1994 NBA Draft, and players could be substituted into the game at half time. The game also featured new hidden teams and hidden playable characters. Early versions of the game included characters from Midway's Mortal Kombat games. Players were also assigned more attributes, including clutch and fatigue levels. In addition, the game also introduced features such as a "Tournament" mode that turned off computer assistance and on-court hot spots that allowed for additional points or special slam dunks.The test version of NBA Jam Tournament Edition included six hidden characters which were taken out of the final version at the request of the NBA: Elviscious, Grim Reaper, Kong, Raiden, Reptile, and Sub-Zero. Midway also stated they would update all test version cabinets to remove these characters.This version was also ported to the SNES, Genesis, 32X, Game Boy, Game Gear, Sega Saturn, PlayStation and Atari Jaguar. 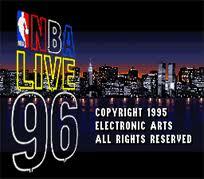 NBA Live 95 is the first of the NBA Live video games series. The cover featured an action shot of the 1994 NBA Finals. The game was published by EA Sports and released in October 1994. It introduced many elements of that would become standard in the series, including the isometric on-court perspective, the "T-meter" for shooting free throws and the turbo button used to give players a temporary burst of speed. The game was re-released with NBA Live 06 as part of the EA Retro Series. Game Players gave the Super NES version of this video game its "best sports game award" in their Super NES division on the January 1995 issue of their magazine. 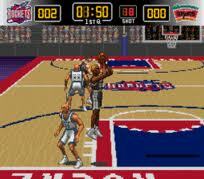 NBA Live 96 is the second installment of the NBA Live video games series. The PC and PlayStation covers features Shaquille O'Neal of the Orlando Magic, while the Super Nintendo Entertainment System and Sega Genesis box covers show a photo of the tip-off to Game 1 of the 1995 NBA Finals. The game was published by EA Sports and released on November 30, 1995. The PlayStation and PC versions were the first games in the series to feature a 3D rendered court, allowing for multiple camera angles using EA's "Virtual Stadium" technology (also used by FIFA Soccer 96 and NHL 96). The on-court player graphics remained 2D sprites. It was also the first NBA Live game released for Sony PlayStation. 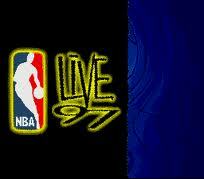 NBA Live 97 is the third installment of the NBA Live video games series. The cover features Mitch Richmond of the Sacramento Kings. 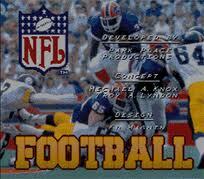 The game was developed by EA Sports and released on November 1, 1996. The PC, Saturn and PlayStation versions featured 3D models for the on-court players, a first for the series. It was also the first NBA Live released for the Sega Saturn. NBA Live 98 is a basketball video game based on the National Basketball Association and the fourth installment of the NBA Live series. The cover features Tim Hardaway of the Miami Heat. The game was developed by EA Sports and released on November 30, 1997 for the PlayStation, October 31, 1997 for the PC and December 31, 1997 for the Sega Saturn. 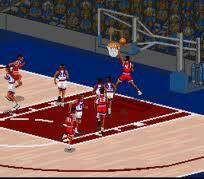 It was the final version of NBA Live released for the Super Nintendo, Sega Genesis and Sega Saturn. The game introduced various innovations to the series, including the now standard feature of passing to any teammate with a single button press. The game also made various graphical improvements, with new player models and faces modeled after actual player photographs. The PC version introduced support for 3D acceleration, utilizing 3dfx's Glide API. The PlayStation, PC and Saturn versions have Ernie Johnson as studio announcer and TNT/TBS color analyst Verne Lundquist doing play-by-play commentary, (the Saturn version does not include play-by-play commentary). NBA Showdown is a trading card game produced by Wizards of the Coast based on the game of basketball. The game is played with customizable decks of cards featuring National Basketball Association players and 20-sided dice. It is one of several sport-themed card games produced by Wizards, including MLB Showdown and NFL Showdown. The one and only set was released in 2002 and contained 228 player cards (175 of which were designated common, the other 53 rare) and 50 strategy cards. Both starter sets and seven-card booster packs were sold. Approximately one in every three booster packs contains a rare card. The NBA Showdown 2002 Starter set contains the following items: 16 Player Cards -including John Stockton and Dikembe Mutombo Rare Cards 40 Strategy Cards 1 20-sided Die 1 Playmat 1 Rulebook 1 Set of Counters and Tokens Shortly after the game was released, several coaches in the Indiana Pacers organization participated in the "Front Office Basketball League" (FOBA), a simulated NBA season using the cards. The game was discontinued after its initial run, though it maintained a small following online via sites such as ShowdownCards.com. 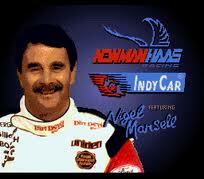 Newman/Haas IndyCar featuring Nigel Mansell - known in Japan as Nigel Mansell Indy Car (ナイジェルマンセル・インディカー?) and in South America as Newman/Haas IndyCar Estrelando Nigel Mansell - is an Indy car racing video game developed by Gremlin Interactive and published by Acclaim, which was released in 1994 for the Super NES and Sega Mega Drive/Genesis.This title can be considered as the sequel to Nigel Mansell's World Championship Racing, and is based on the 1994 IndyCar season featuring Nigel Mansell and the motor racing team Newman/Haas Racing. NFL Quarterback Club is an American football video game for multiple platforms that features quarterbacks from the NFL. It is the first game in Acclaim Entertainment's NFL Quarterback Club series.The first game to use the name was a Game Boy title developed by Beam Software and released under Acclaim's LJN brand in 1993 that was a simulation of the NFL Quarterback Challenge. The following year, Acclaim and LJN released a new multiplatform title under the same name, adding options to play full team games under NFL rules, while retaining the Quarterback Challenge mode. The game was released for the SNES, Sega Genesis and Game Gear. 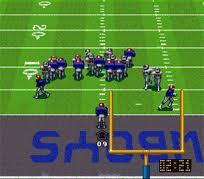 A Game Boy version, called NFL Quarterback Club II and a 32x version were released in 1995. Both these versions omitted the Quarterback Challenge mode, a trend that would continue with NFL Quarterback Club 96.